So you’re well aware that I left my day job in pursuit of freelance work right? Well I’ve landed one that I’m really enjoying, and I want you all to help make it a success! I am working with Paddington Arts, who are a youth organisation encouraging talent development among 6-26 year olds, to organise an event called ‘Reel Talk Live’ which is a live spin-off of their magazine Reel Talk. 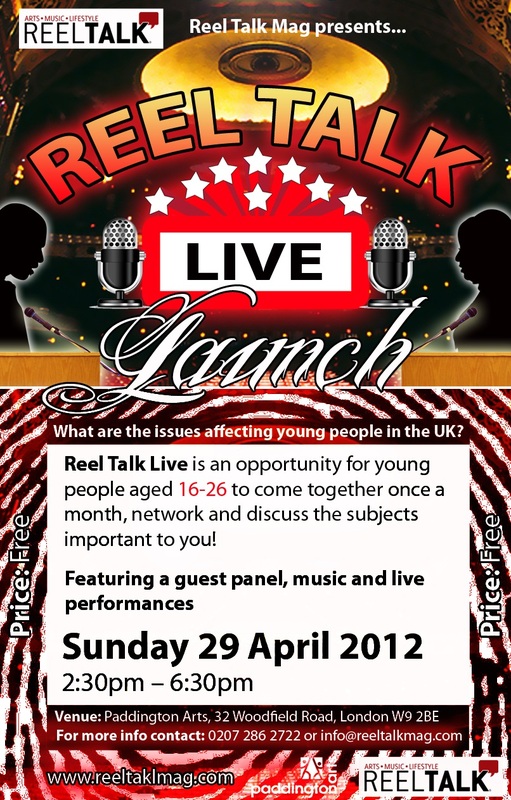 REEL TALK LIVE – an opportunity for young people aged 16-26 to come together once a month, network and discuss the subjects important to you! What are the issues affecting young people in the UK? Do you have a voice that is not being heard? Then this event is for you! Topics can range from Unemployment, Homosexuality and Crime, to Chat Up Lines, Body Image and Relationships. COME AND GET YOUR VIEWS ACROSS IN A FORUM OF YOUR PEERS! This event will feature a guest panel, music and live performances from upcoming young artists. This is the launch of a monthly debate taking place on the last Sunday of the month. Subsequent dates will be: 27 May and 24 June 2012. So please spread the word, forward this link, let all the young’uns know about it, and if you are a young’un or even a young’un at heart, come down and hear what young people have to say, instead of it being dicatated by the media.